Half of Afghanistan’s population paid at least one bribe to public officials over the past year, for a total of $3.9 billion, according to a recent UN report on corruption. $3.9 billion is twice Afghanistan’s domestic revenue, and one quarter the amount international donors have pledged in civilian aid to Afghanistan over the next four years. The findings highlight ongoing concerns over the effectiveness of U.S. reconstruction efforts in Afghanistan. Over the past eleven years, the U.S. has allocated close to $90 billion for Afghanistan aid, including over $20 billion for governance and economic development. The effectiveness of U.S. aid to Afghanistan has long been questioned. On the security side, the U.S. has appropriated over $50 billion to train and equip Afghan forces since 2002. Yet according to a Pentagon assessment, only one of the Afghan National Army’s 23 brigades is capable of operating independently. International donors have tied future funding to improvement on humanitarian and anticorruption efforts. The Afghanistan government remains publicly committed to reducing fraud and abuse, but progress seems uncertain. For example, according to the UN report, the number of bribes in Afghanistan decreased by 9 percent since 2009. But the total amount paid in bribes increased by 40 percent. Similarly, a recent SIGAR report found that Afghan officials are stonewalling U.S. efforts to track the flow of cash out of the Kabul airport. An estimated $4.5 billion was carried out of Afghanistan in 2011, raising fears of money laundering and cash smuggling. Although the U.S. has committed to withdrawing combat troops by the end of 2014, continued support for Afghanistan’s security forces and efforts to build economic stability and governance will likely cost billions of dollars each year. Without a new strategy for our efforts in Afghanistan, billions of U.S. taxpayer dollars could be lost through waste and corruption. Some of the highlights of SIGAR’s investigation into U.S. reconstruction efforts over the past year include $12.8 million in electrical equipment that is sitting unused; $6.3 million paid to maintain Afghan Army vehicles that had been destroyed; and a $400 million for a governance project that actually set back counterinsurgency efforts. Most recently, SIGAR found that the U.S. $1.1 billion spent on fuel for the Afghan Army — fuel that may have come from Iran, in violation of U.S. sanctions. More than ten years since the Afghanistan war began, U.S. has not resolved persistent problems in reconstruction efforts. As the military drawdown progresses, billions of U.S. taxpayer dollars are at risk. The steady stream of aid to Afghanistan is expected to slow in the coming years. But the U.S. and allies have already committed to $16 billion in economic aid to Afghanistan over the next four years. Costs for maintaining the Afghan security forces is expected to come to over $4 billion per year. The IMF and World Bank report that Afghanistan’s ability to close the gap between domestic revenue and spending “is becoming a more distant goal, likely to be reached only after 2032.” In the meantime, the U.S. and allies may have to cover the balance. Expensive, unsustainable reconstruction projects have become a burden not just to Afghanistan’s economy, but to U.S. taxpayers as well. Moving forward, SIGAR writes, “lawmakers and Executive Branch agencies have an opportunity to conduct a strategic reexamination of reconstruction issues.” Policymakers owe it to the Americans to take advantage of this opportunity by ensuring that taxpayer dollars are not wasted in Afghanistan. General John Allen, the outgoing commander of coalition forces in Afghanistan, recommended maintaining a substantial military presence in Afghanistan through the summer, according to a Wall Street Journal interview. The White House has yet to announce a plan for the drawdown of the 68,000 troops still in Afghanistan. Also undecided is the number of troops that will remain after 2014 for training, advising, and counterterrorism operations. Is it too late to address the effect the Afghanistan war will have on the U.S. economy? Maybe, there are certainly some steps we can take. The first one is ending the war and developing a new strategy for more effective (and less costly) engagement with Afghanistan. The commander of coalition forces in Afghanistan said he has recommended that the White House maintain a substantial U.S. military presence through the summer fighting season, giving new details about commanders’ preferences as President Barack Obama weighs the pace of withdrawal. Afghanistan’s largest private airline, Kam Air, has been barred from receiving US military contracts amid allegations of drug smuggling, officials say. Nearly 12 years after the US-led invasion of Afghanistan began, a war-weary America is getting ready to leave. But there will be little in the way of a peace dividend for the US economy once the fighting stops. The total amount of nonmilitary funds Washington has appropriated since 2002 “is approximately $100 billion”—more than the US has ever spent to rebuild a country. That estimate came out in July. Since then, Congress has appropriated another $16.5 billion for “reconstruction.” And all of that has not bought the United States or the Afghans a single sustainable institution or program. The counterinsurgency cult was more than a fad, Kaplan establishes. But it was much less than a revolution. Compromise, conflict, or collapse: ask an Afghan what to expect in 2014 and you’re likely to get a scenario that falls under one of those three headings. Stiglitz, recipient of the 2001 Nobel Prize in economics, and Bilmes, a professor at the Harvard Kennedy School, are no strangers to the concept of hidden and delayed war costs. In 2008 they authored a groundbreaking study showing that the Iraq war, officially counted at $800 billion, would likely cost on the order of $3 trillion. The same thing will happen in Afghanistan, the authors of The Three Trillion Dollar War write. The direct cost of the war has already topped $600 billion. Ongoing military operations will bring that total to at least $700 billion through 2014. Even after U.S. forces transition from a combat to a training and advising role, the financial burden of the war will continue. Stiglitz and Bilmes highlight some of the big costs, like caring for the veterans of the Afghanistan war (total estimated cost: $1 trillion); supporting the Afghan security forces ($5 billion to $8 billion per year). U.S. aid to Afghanistan is also sure to be a significant issue. Congress has already appropriated close to $90 billion — over $50 billion for security assistance and close to $40 billion for economic and humanitarian reconstruction. Despite this significant investment, the Afghan security forces remain largely incapable of operating independently of U.S. and allied trainers. Meanwhile, billions of aid dollars have been wasted on unneeded and unsustainable projects, or simply lost to fraud and corruption. Congress is taking small steps to increase transparency and accountability in U.S. aid to Afghanistan. But it may be too little too late. In Afghanistan, the U.S. strategy has created an aid bubble and made little sustainable progress on the security front. In the U.S., the war has been a drag on the economy, driving up the projected national debt. “The legacy of poor decision-making from the expensive wars in Afghanistan and Iraq will live on in a continued drain on our economy – long after the last troop returns to American soil,” Stiglitz and Bilmes conclude. Is it too late to address the effect the Afghanistan war will have on the U.S. economy? Maybe, there are certainly some steps we can take. The first one is ending the Afghanistan war and developing a new strategy for more effective (and less costly) engagement with Afghanistan. Another essential step is reining in government spending (and the out-of-control defense budget in particular). These won’t be easy steps, but they are crucial if we want to get our fiscal house in order. Last week’s suicide bomb attack on Afghanistan’s intelligence agency was followed by an attack on the headquarters of the Kabul traffic department a few days later. The coordinated assaults have raised questions about Afghanistan’s security forces and intelligence capabilities, and whether the billions the U.S. has spent on security assistance has been effective. According to a new audit by the U.S. Inspector General for Afghanistan Reconstruction, the U.S. spent $6.8 million on maintenance for vehicles that had not been seen in over a year, had never been seen, or had been destroyed. Insurgents Monday stormed the traffic-department headquarters in Kabul, using the compound to target nearby Afghan police headquarters and setting off a gun battle that continued for hours. This month – after half a dozen years of hearings, reports, overseas fact-finding trips, painful compromises and some last-minute, round-the-clock negotiating – the first substantial overhaul of the federal government’s wartime contracting practices since World War II finally became law, with McCaskill as its chief architect. We’ve already paid a huge price in lives, misery and money, including multiple deployments and suicides…Does anyone really believe that keeping large numbers of our military there will lead to a long-term, satisfactory outcome? [Perhaps] NATO and U.S. officials will finally sit down to hash out what to do next with America’s top partner in the fight against terrorism in South and Central Asia. The White House in particular, might want to consider whether it can continue to tie America’s fortunes to intelligence outfits like NDS without first figuring out how (and whether it’s possible) to help governments like Karzai’s to clean these agencies up. After more than a decade of nation-building in Afghanistan, with at best mixed results, perhaps it is time to take an opposite tack…This would mean challenging the guiding notion of democratization that has, thus far, cost us and our allies several thousand casualties and about a trillion dollars — to little effect. 2012 saw some important milestones in the Afghanistan war. The last of the surge troops left Afghanistan in September. U.S. and Afghan officials met twice to discuss post-2014 plans. The international community emphasized its continued commitment to Afghanistan by pledging billions in economic aid. But the past year also brought more questions about whether the billions the U.S. has spent in Afghanistan were an effective use of taxpayer money. “[The military’s equipment in Afghanistan] estimated to be worth more than $36 billion, has accumulated during a 10-year period. DOD officials also estimate that it could cost $5.7 billion to return or transfer equipment from Afghanistan. The U.S. is looking to shift its military strategy in Afghanistan, moving from a combat role to training and advising the Afghan security forces. The Wall Street Journal reports that the shift could be implemented next year. Despite being billed as a changed strategy, this move is really just a clarification of the current strategy. The U.S. plans to withdraw all combat troops by the end of 2014, letting Afghan security forces take the lead role for ongoing counterinsurgency operations. If the transition from U.S. and allied forces to local forces begins next year, some of the 66,000 U.S. troops currently stationed in Afghanistan may be withdrawn earlier. If the transition is undertaken closer to the 2014 deadline, some troops may stay longer. The “shift” in the U.S. strategy is less a shift than a hint at the drawdown timeline for the next two years. An accelerated withdrawal of U.S. troops would be good first step, but it falls short of what is needed: a reevaluation of the U.S. strategy in Afghanistan. The current strategy relies on a heavy military footprint today and the capabilities of the Afghan security forces tomorrow. But reliance on military force hasn’t solved Afghanistan’s security problems. In fact, there is clear evidence that increasing troop levels actually contributes to an increase in the number of insurgent attacks. As for the second piece of the strategy — the Afghan security forces, which are supposed take the lead in 2014 — U.S. training efforts seem to have fallen short. Congress has allocated over $50 billion in security aid to Afghanistan since 2002. The funds support programs to train and equip local Afghan forces. Despite the billions invested in Afghanistan’s security forces, serious doubts about their capabilities remain. According to a Pentagon report released just last week, only one of the Afghan Army’s 23 brigades can operate without support from the U.S. and allies. Focusing on the training mission in won’t solve the fundamental problems with the U.S. strategy in Afghanistan. After eleven years and more than $500 billion, it’s time for U.S. leaders to eliminate wasteful war spending and develop a strategy that works. It’s no secret that public support for the war in Afghanistan is fading. According to a recent opinion poll, 66 percent think the costs of the war outweigh the benefits — up from 41 percent five years ago. 60 percent of Americans support withdrawing troops as soon as possible, according to an October Pew poll. A new part of the debate over U.S. policy in Afghanistan is the growing support in Congress for ending the war. Last week, the Senate approved an amendment to the National Defense Authorization Act calling for an accelerated drawdown in Afghanistan. While the measure is nonbinding, it is a clear sign that Congress may be catching up to the public. The Senate also passed a measure to improve oversight of wartime contracting. The amendment implements the recommendations of the Commission on Wartime Contracting, which determined that as much as $60 billion has been lost due to contract waste and fraud in Iraq and Afghanistan. 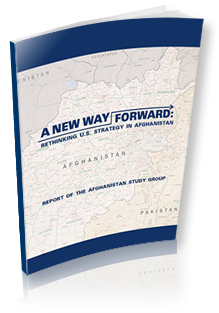 Of course, despite the growing bipartisan consensus for a new strategy in Afghanistan, there are still some who support continuing the current strategy. The administration has committed to withdrawing the 68,000 combat troops over the next two years. Some administration officials are reportedly considering keeping about 10,000 troops to support ongoing counterterrorism operations. Still others have called for keeping 30,000 troops in the country, a move that would cost over $30 billion each year. The U.S. has already spent close to $600 billion and over ten years in Afghanistan — a clear sign that the current strategy isn’t working. Spending billions more to sustain a large military presence is not only unnecessary, it is fiscally irresponsible. The momentum in Congress for ending the war is a good first step toward a more effective strategy in Afghanistan, and a better plan for spending taxpayer dollars. The U.S Senate approved a non-binding resolution calling for an accelerated transition to local security forces Afghanistan, withdrawing U.S combat forces earlier than the planned 2014 deadline. Meanwhile, Defense Secretary Leon Panetta said ongoing counterterrorism efforts in Afghanistan will require an “enduring presence” post-2014. The story of Combat Outpost Keating is perhaps one of the most tragic of the Afghanistan war. The U.S. camp was located in a remote area of Afghanistan, near the Pakistan border, at the base of three mountains – a nearly indefensible position – defend the position, at great expense by U.S. forces, for over three years. In a bipartisan vote of 62-33, the upper chamber approved what’s called a “sense of Congress” measure offered by Sen. Jeff Merkley, D-Ore., that formally stamps Senate approval on an “accelerated transition of United States combat and military and security operations to the government of Afghanistan,” according to a Senate summary of the provision. The U.S. intends to wage a counterterrorism campaign inside Afghanistan even after the main U.S. combat force leaves in 2014 in order to prevent al-Qaida from fulfilling its ambition to re-establish a sanctuary there, Defense Secretary Leon Panetta said Thursday. Marine Corps General Joseph Dunford, who takes over as head of international forces in Afghanistan next year, faces the challenge of winding down a war in a country where he has little experience using a strategy he did not devise. When the two sides meet again this month for more substantive discussions, each will begin to lay out a competing set of military concerns, political constraints and legal priorities that could severely test their fledgling postwar partnership, possibly to the point of failure. Protecting these [vital national security] interests after 2014 will require the United States to be able to launch precision military strikes from this region. But it will not require tens of thousands of U.S. soldiers in Afghanistan. [The drawdown] should start now and should not take more than a year. We strongly supported the war in Afghanistan following the attacks of Sept. 11, 2001, but after more than a decade of fighting and a cost upward of $500 billion it is time for a safe and orderly departure. Pentagon officials say a recommendation on post-2014 troop levels is coming within weeks, although the specific number of troops is still undecided. The administration reportedly favors keeping 10,000 troops in Afghanistan. Some political pundits are calling for a heavy military footprint of 30,000, while other experts ask why the U.S. still has 66,000 combat troops in the country. Despite official U.S. assessments that al Qaeda leadership has been “decimated,” some experts are insisting that the U.S. maintain a heavy military footprint in Afghanistan — a strategy that will cost billions of dollars each year. The Pentagon says it plans to tell the White House within weeks how many American troops military leaders believe will be needed in Afghanistan after 2014 to train local forces and continue to target al-Qaida. Land under opium cultivation in Afghanistan increased 18% this year, despite a decade of efforts by the international community to get Afghan farmers to switch to legal, though less lucrative, crops, a survey released Tuesday said. For Obama, could 10,000 troops in Afghanistan be too many? President Barack Obama publicly scoffed at the idea of keeping 10,000 troops in Iraq. So could he really be persuaded to keep that many in Afghanistan after the war formally ends in 2014? How Long Will it Take to Leave Afghanistan? Why not just start now? If all it takes is a year, then the United States could plausibly be out of Afghanistan by this time next year…it would mean one less year of American casualties on the battlefield – and one less year spent trying to make the Afghan army into a real fighting force. New World Strategies Coalition, Inc.